The commemoration of actor-comedian John Clarke’s passing and the ascent of film director Taika Waititi (Boy, 2010, and Hunt for the Wilderpeople, 2016) has thrust irreverent Kiwi humour back into the public consciousness in its dealing with dark worldviews with warmth and laconic resilience. In a similar spirit, the series of public exchanges that Aotearoa artist Mark Harvey offers in Helping Hand may raise chuckles at first, but his personal charm merges cheery humour with acts of dogged openness. The work aims to address the effects of decentred, social-mediatised discussion and asks us to question the ideological filter bubbles through which we conduct political discussion with strangers. 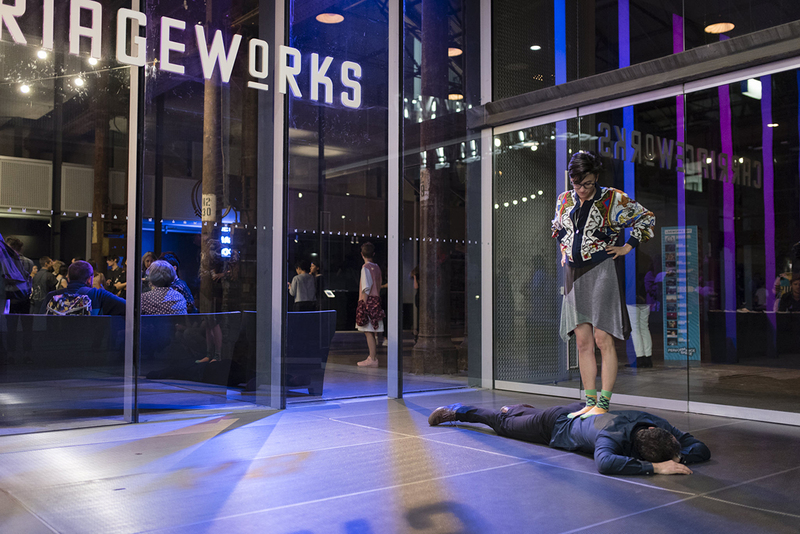 Out of seven different exchanges on offer, I make it to three: Thought Leader, Backward Conversation and Face Down Projections, each occupying or traversing various Carriageworks spaces. There are no bookings to be made with Harvey. I find him by spotting a festival minder who keeps a respectful distance. Harvey is either waiting for someone to make the first move or is already deeply engaged in conversation with participants, which I am invited into as soon as he catches my eye. In Face-Down Projections, the artist invites participants to stand on his back while he lies flat on his stomach on harsh concrete and during which he claims to be able to measure our individual carbon footprint. With the help of the artist minder, I take a moment to stabilise my position on the artist’s back before heading into a discussion about climate change and energy policy, checking my balance every so often. Mostly I am concerned about my daily energy consumption converted into body mass and the force I’m placing on his coccyx. 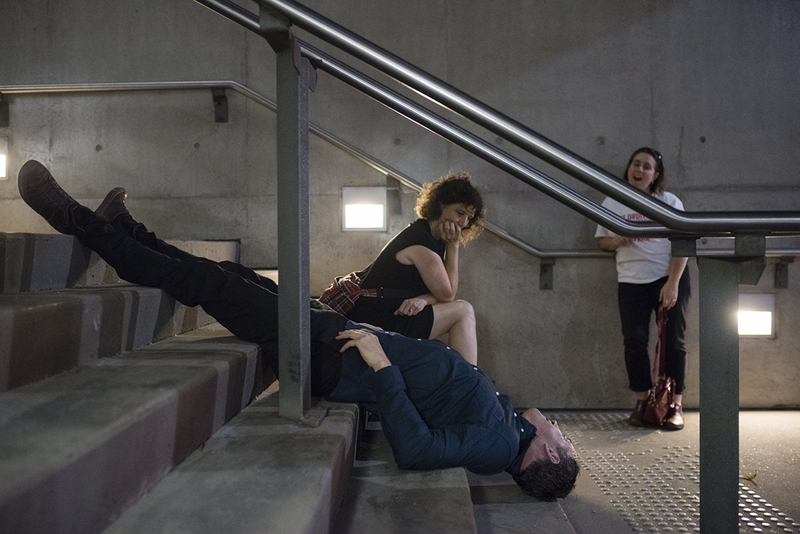 For the last encounter, Backwards Conversation, a small group of us discuss the Australian Government citizenship debacle of the day while following the artist who leads us by walking backwards, tracing the entire, vast Carriageworks foyer. We continue without a hiccup, only momentarily interrupting the conversation to warn Harvey of any obstacles behind him. Sadly, my progressive cultural bubble isn’t challenged in this conversation with other live art afficionados. Instead, what Mark Harvey manages to illuminate is that by making physical peril a prerequisite to conversation, we are forced to consider the stakes of voicing our opinions to each other. If passionate disagreements arose at any point, would we have been thrown off our emotional centres and stopped looking out for our own and the artist’s safety? At what cost and risk are we prepared to voice those views?